Anyone who exercises regularly expects to get wet during his or her workout—“sweat wet,” that is. But those looking to add novelty to their exercise routines (and who have access to a lake, pond or pool) can employ moves on or in the water for a fresh, cooling dimension that also puts new groups of muscles to work balancing and overcoming water resistance. 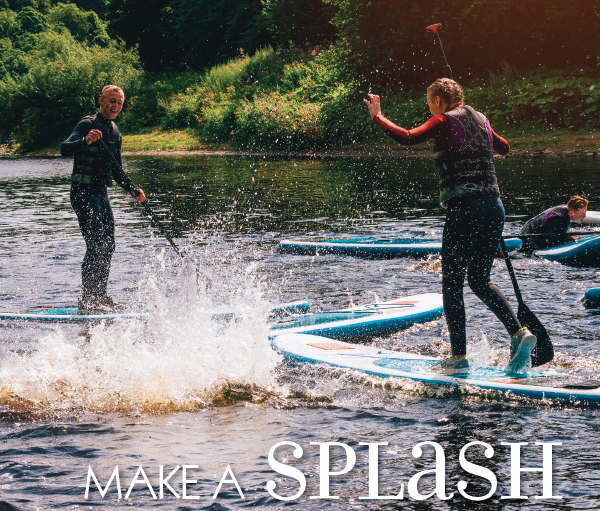 For those with lake, pond or even pool access, the stand-up paddleboard—“SUP” to the user community—is a quality workout in itself. SUPs also offer a fun and challenging dimension to yoga. Being on top of an unstable platform forces your entire body into the “balancing act” required. Technique-wise, a squirmy SUP will let you know right away if your weight distribution is amiss. With a floating surface as your exercise mat, there’s less room for error. So if you feel like you’ve pretty well mastered your land-based yoga routine, nailing downward dog, three-legged dog, split cat or even easy seated posture on a paddleboard provides a new challenge. When SUP exercisers do fall, they have little choice but to get back up and give it another go. Beyond that, water lapping against the board adds calming aspects of sight and sound, while a swim when the workout is over contributes another relaxing and refreshing dimension. Fans of SUP yoga also note that standing on a paddleboard provides a nifty perspective of both the water and the horizon. Some liken it to “walking on water,” and say the possibility of falling off helps achieve focus on themselves and their poses. Glenda Wynne, yoga instructor and co-owner of a VitaZen, a yoga studio and health supplements store in Hardy, is an SUP instruction convert. 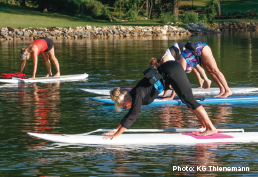 For the past two summers, she’s led paddleboard yoga classes offered by Franklin County Parks and Recreation. Of course, just paddling your board in and of itself is a good workout for arms, shoulders, torso and knees. You can develop a course that suits your initial exercise goals, and then gradually increase the distance or the pace to kick it up a notch. Bonus benefits of an early morning paddle include enjoyment of a serene lake, fresh air, sunshine and wildlife. Kayakers also swear by the combined therapy and exercise they gain from skimming along the surface in a highly maneuverable paddle or peddle craft. One SML enthusiast, who heads out in her peddle-style kayak most weather-permitting days, compares it to a cycling workout—without the stress of hills and danger from passing traffic. Then there’s SML’s Wendy Lewis, 70, who has a twice-weekly appointment with a gaggle of other kayakers from coves near marker R22. “We paddle at a fairly leisurely pace, and typically stay out about 2½ hours,” Lewis says. 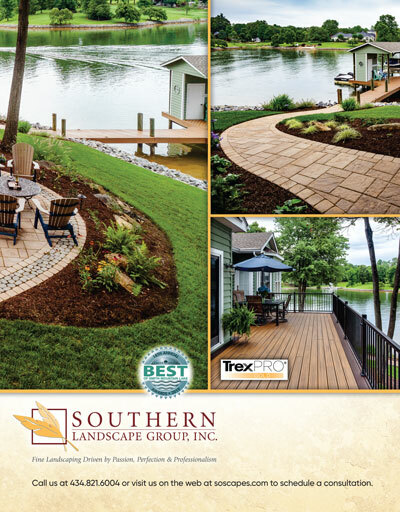 “We love starting the day early and communing with nature and each other. That’s why we call our group the Ky-Yakers. Novelty is an important aspect of keeping exercisers engaged over periods long enough to realize the beneficial effect. Water aerobics, like SUP yoga, brings exercisers a fresh new wet dimension that can rejuvenate the exercise regime. Olympic synchronized swimming judge Kris Olson started teaching water aerobics back in 1980 when the Fairfax County Park Authority opened a new pool and wanted to attract members of the area’s elder population. Now she leads a neighborhood class through hour-long water aerobics routines twice a week at the Waverly subdivision on the shores of Smith Mountain Lake, during the warm water months. “The water’s resistance is a forgiving replacement for weights, so there’s less chance of a strain,” Olson says. “You can exercise on warm days without overheating, and it’s particularly good for rehab from injuries and joint surgery. Olson and her classmates wear float belts for safety and stability. They also use hand-held foam barbells for a number of the exercises to increase resistance. 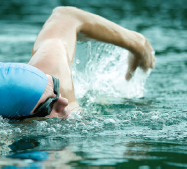 Swimming is another good exercise option for those who want to utilize the water for fitness. It’s a full-body workout that builds lung capacity, muscle stamina and flexibility and is especially well suited to rehabilitation exercise because of the support water provides. Swimmers most typically opt for laps in a pool, but SML is definitely an option. One can define a course to lap between docks, for example, which has been a long-time routine for Vicki Gardner, a Goodview resident and executive director of the SML Regional Chamber of Commerce. Since your lake course will not likely be life-guarded, Gardner recommends wearing a flotation belt or unencumbering flotation vest (thin, low-resistance vests are made for wake boarders and available online). It’s also a wise idea to swim with a buddy or have someone available on the dock or shoreline.